Sponsored by Newground, this award is given to an individual, administrator, coach or official who has made a highly significant voluntary contribution to underrepresented groups in sport. 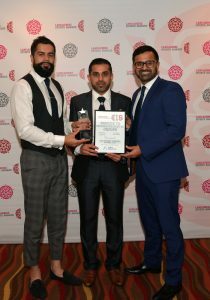 The winner of the Services to Underrepresented Groups Award was Abu Hanifah Foundation Football Club. Abu Hanifah Foundation Football Club is based at Blackburn Power League Soccerdome and Woolridge playing fields opposite Pleckgate High School. AHF FC provide activities for various age groups including 146 children playing in a Charter Standard League every Sunday, 278 children playing recreational football at their FA affiliated Community Development Centre, a Pan Disability coaching session with 9 participants and over 60 girls are part of the Girls Sports Club. In both 2015 and 2017 the club was awarded Lancashire FA Charter Standard Club of the year and they also went on to win National FA Charter Standard Club for 2015.